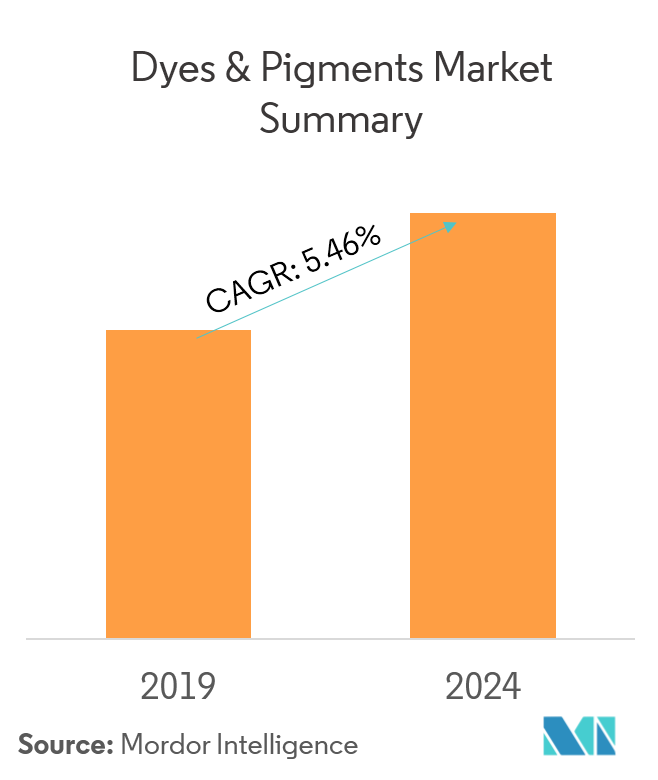 The market for Dyes & Pigments is anticipated to register a CAGR of 5.46% during the forecast period 2019-2024. Major factors driving the market studied are growing demand from the paints & coatings industries of Europe and Asia-Pacific, and rising demand from the textile industry. In 2018, by end-user industry, the paints & coatings segment is expected to dominate the market, in terms of revenue. The industry faces several concerns regarding the emission of harmful VOCs from coatings. Conventional petroleum-based products are constantly coming under scrutiny, due to the increasing effort to reduce carbon footprint. These concerns have encouraged the emergence of bio-based solvents and pigments for exceptional bio-degradable properties. As consumers become more conscious of environmental impact and sustainability, organizations are expected to be more heavily impacted by their commitment towards minimizing the environmental footprint from their existing and upcoming products. In the last two decades, the EPA, along with other national and international agencies, has placed increasingly strict regulations on the manufacture and use of synthetic colorants. A majority of dyes and pigment are used in the textile industry. Most processes that are performed in textile mills produce atmospheric emissions. Speculations concerning the amounts and types of air pollutants emitted from textile operations has been widespread. This is likely to hinder the market’s growth. Paints & coatings account for the largest share of the market and is estimated to be the fastest growing end-user industry. Architectural and decorative coatings account for the largest consumption of pigments in their production. Thus, rising construction and infrastructure activities in Asia-Pacific act as the major driver for the dyes & pigments market. In addition, public-private partnership (PPP) projects have also been increasing in the domestic construction sector. In India, the infrastructure sector has become one of the major focus area for the government. The government aims to boost the construction of buildings in the country, for which it has decided to come up with a single window clearance facility, in order to provide speedy approval for the construction projects. All the aforementioned factors, are expected to drive the global market during the forecast period. 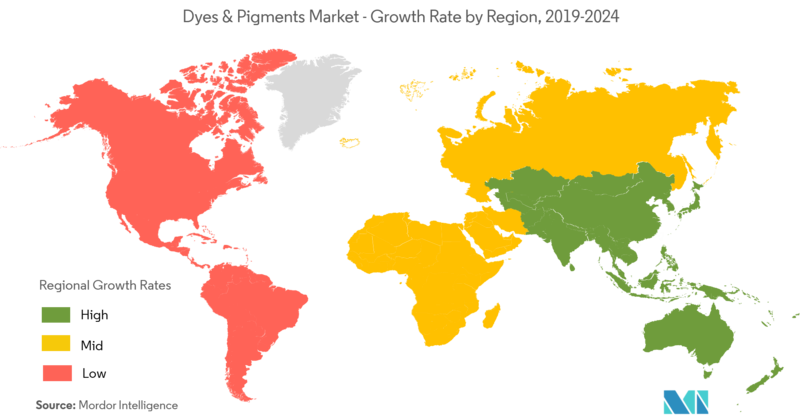 Asia-Pacific region accounted for the largest share of the global dyes & pigments market. The growth of textile industry in China and India is rapidly increasing with the availability of cheap labor force. In the global textile market, China holds the largest share of about 40%, followed by India with over 5% share. Among ASEAN countries, Indonesia has a major share of the paints & coatings market, followed by Thailand, where the urbanization is projected to increase to 56% by 2020. Hence, with the increasing demand from the various end-user industries, like the paints & coatings, printing inks, textiles and plastics industry, the demand for dyes & pigments is expected to rapidly increase over the forecast period. 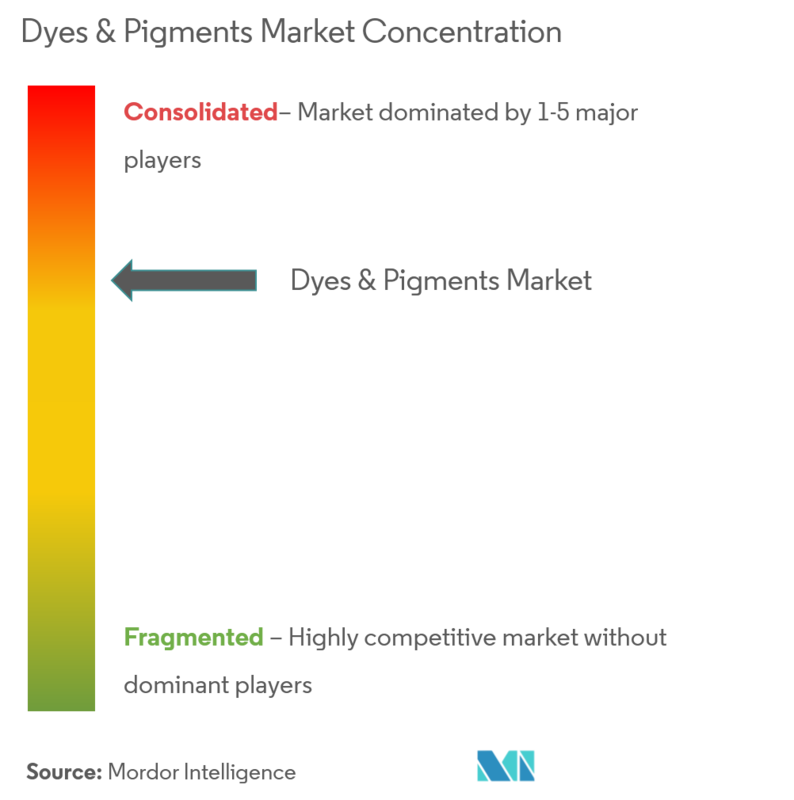 The dyes & pigments market is partially consolidated. In terms of market share, few of the major players currently dominate the market. 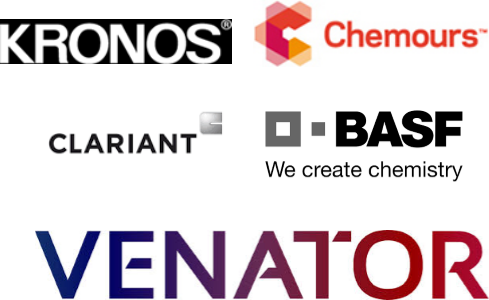 Key players in the dyes & pigments market include BASF SE, The Chemours Company, Venator Materials PLC., Kronos Worldwide Inc., and Clariant, Bodal Chemicals Ltd, CRISTAL, Huntsman Corporation, Flint Group among others.